As of this moment, the 3rd Edition of the Basic Fantasy RPG Core Rules and The Basic Fantasy Field Guide are both available on Lulu.com and CreateSpace.com! 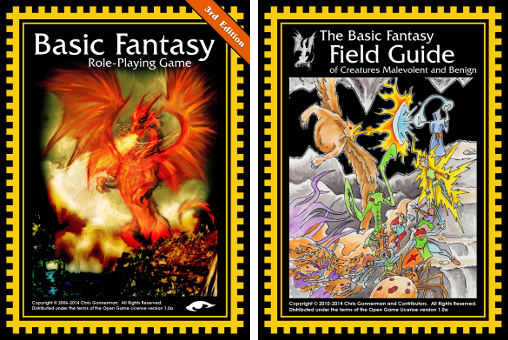 Amazon.com distribution will follow shortly, and both books have been submitted to RPGNow.com. Lulu.com will have both hardback and paperback editions. CreateSpace.com will have only paperback versions, and as they supply Amazon.com, that’s what they’ll have as well. RPGNow.com will eventually have both hardback and paperback editions; note that RPGNow hardbacks are a bit bigger than Lulu hardbacks. Note: You may need to go to the second page to find the new releases. There’s more to come! I anticipate the release of both J.D. Neal’s adventure series JN3 Saga of the Giants and my own multimodule BF3 Strongholds of Sorcery sometime in 2015. I wouldn’t be at all surprised if we managed to get J.D.’s adventure out by Easter; mine will take longer, but I have high hopes that it will make it out before Halloween. House of Coldarius, one of the adventures in Strongholds of Sorcery, is very appropriate to Halloween, so that’s why I’m aiming for that date. And depending on submissions, it’s entirely possible that AA2 Adventure Anthology 2 might be in print for Christmas 2015. So stay tuned! This entry was posted in Promotion on November 26, 2014 by Solomoriah. James Lemon on Why not add X to the game?